My first observation is that I love the cool intellectual style of the book – this is no mere name-calling polemic, this is an attempt at a logical explanation of the differences between orthodox, biblical Christianity and the more liberal form it can take. The purpose of this book is not to decide the religious issue of the present day, but merely to present the issue as sharply and clearly as possible, in order that the reader may be aided in deciding it for himself.Read more at location …. Clear-cut definition of terms in religious matters, bold facing of the logical implications of religious views, is by many persons regarded as an impious proceeding. Machen observes that, in light of the rise of scientific method, many beliefs from antiquity have been challenged and rightly overthrown, and so Christianity, especially due to its specific historical claims, must face the challenges of science and reason head on. He mentions that some errantly believe that since many traditions or ideas from the past have been debunked, all of them will be. Of course, this denies that any ancient wisdom was actually true, which is ludicrous on its face. It is obvious that every inheritance from the past must be subject to searching criticism; and as a matter of fact some convictions of the human race have crumbled to pieces in the test. Indeed, dependence of any institution upon the past is now sometimes even regarded as furnishing a presumption, not in favor of it, but against it. So many convictions have had to be abandoned that men have sometimes come to believe that all convictions must go. However, Machen also reveals the opposite logical fallacy of many moderns, that of assuming that newer perspectives are always more accurate or true (argumentum ad novitatem). The writers of the books in question were no doubt men of their own age, whose outlook upon the material world, judged by modern standards, must have been of the crudest and most elementary kind. Inevitably the question arises whether the opinions of such men can ever be normative for men of the present day; in other words, whether first-century religion can ever stand in company with twentieth-century science. 3. Christianity makes objective historic claims that can and should be tested by science. Machen is setting us up here – while orthodox Christianity makes testable truth claims, liberal Christianity shies away from this, avoiding any interaction with science and reason, but instead, as we will see, contradicting them! For, rightly or wrongly, religion during the centuries has as a matter of fact connected itself with a host of convictions, especially in the sphere of history, which may form the subject of scientific investigation; our simple Christian, whether rightly or wrongly, whether wisely or unwisely, has as a matter of fact connected his religion, in a way that to him seems indissoluble, with convictions about which science also has a right to speak. 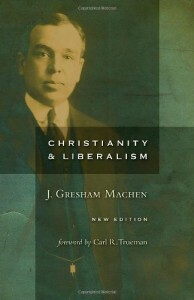 Machen argues that liberal Christianity is an entirely different religion, not a mere variant. The liberal theologian seeks to rescue certain of the general principles of religion, of which these particularities are thought to be mere temporary symbols, and these general principles he regards as constituting “the essence of Christianity”….what the liberal theologian has retained after abandoning to the enemy one Christian doctrine after another is not Christianity at all, but a religion which is so entirely different from Christianity as to belong in a distinct category. Essentially, liberal Christianity is reductionist, in that it tries to reduce Christianity to a mere ethic, stripping it of it’s historic, miraculous, exclusivist, triumphalist, eschatalogical, and soteriological components. The liberal attempt at reconciling Christianity with modern science has really relinquished everything distinctive of Christianity, so that what remains is in essentials only that same indefinite type of religious aspiration which was in the world before Christianity came upon the scene. 5. Liberal Christianity is vulnerable on two fronts – it is both un-Christian as well as contrary to science. Two lines of criticism, then, are possible with respect to the liberal attempt at reconciling science and Christianity. Modern liberalism may be criticized (1) on the ground that it is unchristian and (2) on the ground that it is unscientific. Machen introduces us to his main thesis, which he will back up later in the book – that liberal Christianity backs away from the historical and literal claims of scripture *because* it thinks them incompatible with science. Rightly respecting science, but not reason, they try to hold on to scripture by demoting it to metaphor when it often is clearly not claiming to be such. 6. The danger of this flight from reason and rejection of tradition ends in socialist social engineering. Machen makes a bit of a jump here, but he argues that in abandoning the moral and historic claims of Christianity, modern man and liberal Christianity retreat to a utilitarianism, which then justifies itself in socially engineering what it thinks is best, and in doing so, reducing human freedoms. Like I say, it’s a bit of a jump, and I can’t even find a quote here in the intro where he makes the logical connection. Machen uses the example of public education, and makes many authoritarian accusations that are easily seen in the liberal educational system of today. When once the majority has determined that a certain regime is beneficial, that regime without further hesitation is forced ruthlessly upon the individual man. It never seems to occur to modern legislatures that although “welfare” is good, forced welfare may be bad.Read more at location …. In other words, utilitarianism is being carried out to its logical conclusions; in the interests of physical well-being the great principles of liberty are being thrown ruthlessly to the winds…. The tendency is making itself felt especially in the sphere of education. The object of education, it is now assumed, is the production of the greatest happiness for the greatest number. But the greatest happiness for the greatest number, it is assumed further, can be defined only by the will of the majority…. Idiosyncrasies in education, therefore, it is said, must be avoided, and the choice of schools must be taken away from the individual parent and placed in the hands of the state. Machen concludes this section by implying that only orthodox Christianity can save us from the tyranny created by liberalism. In setting forth the current liberalism, now almost dominant in the Church, over against Christianity, we are animated, therefore, by no merely negative or polemic purpose; on the contrary, by showing what Christianity is not we hope to be able to show what Christianity is, in order that men may be led to turn from the weak and beggarly elements and have recourse again to the grace of God. If all of that sounds counter-intuitive and unsubstantiated to you, it does to me too. But we’ve got an entire, highly respected book, to evaluate.